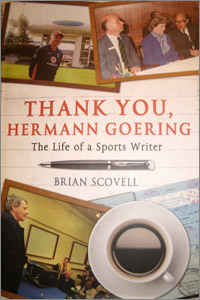 Brian Scovell has been a highly respected sports writer and author for half a century and this highly entertaining autobiography touches on not only his career as a writer on cricket and football but his early life on the Isle of Wight, his great love for his wife, Audrey, and his battle after an accident at an early age which left him with a stiff leg. The title of the book refers to this early accident which was caused by a wartime raid on the Isle of Wight by the Germans and not helped by a surgeon who should have done more and so, from the age of eight, Brian Scovell has had to endure this presumably avoidable injury. I met Brian on one of Bill Frindall’s tours to Guernsey and a fascinating walk around Herm showed me that not only was he an extremely interesting and witty person but he walked at a good pace and showed himself the next day to be an extremely competent batsman and slip fielder. In his autobiography, Brian mentions his numerous cricketing exploits of which he can be justifiably proud. The story of his late wife, Audrey, is an endearing one and is one of the main themes of the book. I also enjoyed some of his, at times, thinly veiled comments on modern standards which I wholeheartedly agree with but a hypochondriac such as me wasn’t so keen on the long list of friends and colleagues who had passed away through illness. A teetotaller and non-smoker, Brian has also been a fit man but who still suffered more latterly with heart problems. However, his is a worthy example of how to avoid the pressures and distractions of his job. Cricket is a sport richly written about and, for the cricket collector, Brian Scovell’s memoirs as a sports writer would make an invaluable addition and different facet to any collector’s library.